This is the first week of a month-long celebration of being a part of this great industry. InfoComm calls it AV Month. We at AVNation will be doing our 3rd annual 31 in 31. 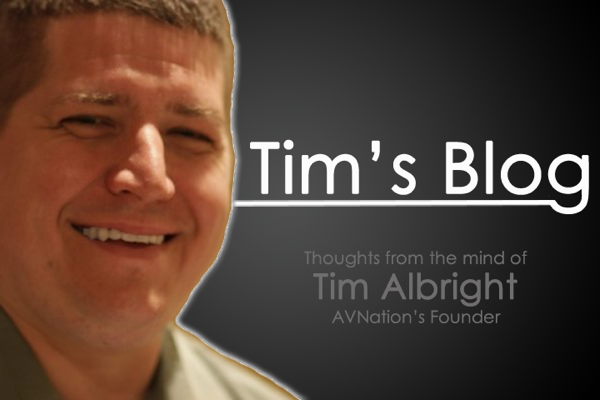 It’s a great time to give you some unique perspectives from AV pros from all walks of life. In addition to taking a look at the 31 in 31 posts, here are some other ways to celebrate AV Month. This month the InfoComm community will elect three members to the open seats on the Certifcation Steering Committee. If you’ve ever thought of being on a committee now is your chance. The deadline is October 5 to get your application in. If you don’t want to be on then please vote when the time comes. These are the AV professionals who will represent us, certification holders, over the next year. Of course while we recommend looking at all candidates for the seats, our own Editor-in-Chief, Josh Srago, is seeking reelection to the CTS seat. Some of my favorite ideas from past AV Months have been about letting your local community know about the opportunities in the audiovisual industry. This can be as simple as hosting high school students in your shop, getting involved with a technical school, or speaking to a regional business group. When you reach out locally to let people know what it is we do it’s a great chance to introduce the next generation to AV. We all get into ruts. From time to time it’s nice to shake things up a bit. AV Month is a great time to do that. We think AVNation is pretty great. We are not the only ones making content for the AV community. Below are some of the sources I use when producing AVWeek and ResiWeek to get news, information, and insight on the community. You might want to check them out as well. AVMonth is also a good time to learn something new, or go deeper on a subject you already know. This can be manufacturer specific training or getting more general industry knowledge. InfoComm and others have great classes, most of which you can take online. However you decide to celebrate AV Month, let others know about it. We really do work in an incredibly exciting and dynamic community.